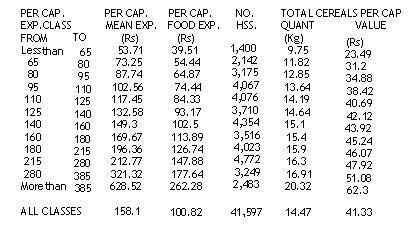 Directions: The following question 1-2 are based on the bellow table, which shows per capita Mean Expenditure, Per capita Food expenditure, Number of Households and Per capita cereal consumption, in both quantity and value, for different expenditure classes of rural India. The sampled 41597 households are divided into 12 expenditure classes, starting from less than Rs.65 per month per capita and ending at more than Rs.385 per capita per month. Directions: Questions 3 to 7 are based on the following data. 1. According to the results of this sample survey, what is the proportion of total expenditure on food to total expenditure for all the sampled households taken together? 2. What is the difference, approximately, between the gross expenditure of the sampled households in the Rs.95-110 expenditure class and in the Rs.180-215 expenditure class? 3. 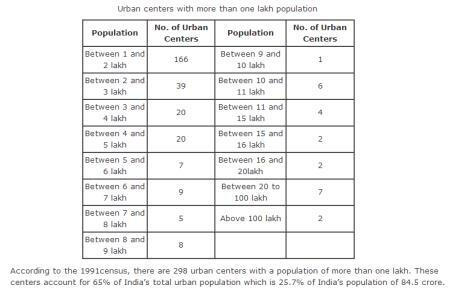 If the two urban centers, where the population is more than 100 lakh, do not exceed 110 lakh, what percent of the urban population of the 298 centers mentioned in the data, do they approximately form? 4. How many people, who are a part of India’s urban population, do not live in the above mentioned urban centers? 5. What is the ratio of the number of urban centers with population above odd number categories to that of the number of urban centers with population above even number categories? 6. The number of urban centers, having population greater than 10 lakh but less than 20 lakh forms what percent of the number of centers having a population above 2 lakh? 7. When the population was between seven to eight lakh, how many urban centers were there?